I have to admit that even though we have been living in Italy for over two and a half years now, I still have a few boxes waiting to be unpacked. They have been languishing hidden away in the huge wardrobe in our spare room and at least once week I would wake up with the firm intention of finally dealing with them. Only for it never to happen. You see, these boxes contain my stash. My stash of beads, papers and all sorts of creative tools I happily accumulated over ten years or so. For I used to be big on crafts. 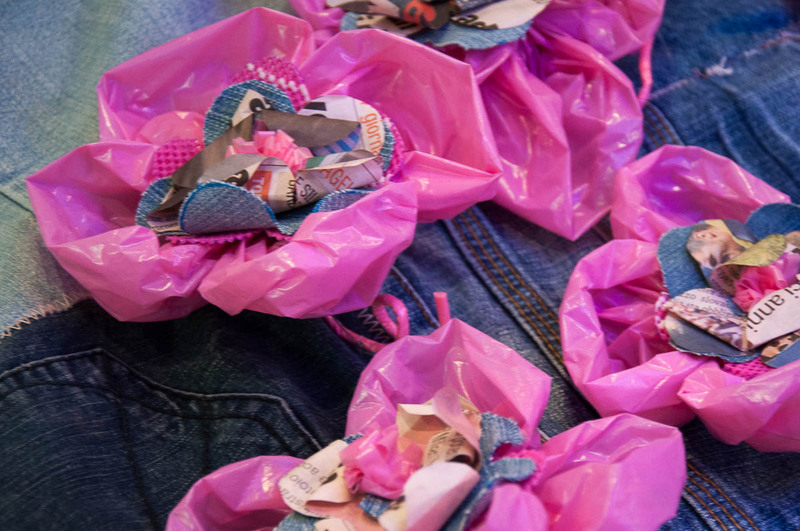 Starting with handmade cards and slowly progressing to beaded jewellery and silversmithing, I used to spend hours and hours of my free time on making things and going to courses to learn how to make more things. As it gave me such a satisfaction, such a kick to look at something (admittedly) simple which I had put together with my own two hands – a novelty feeling after spending my whole working day chained to a computer. 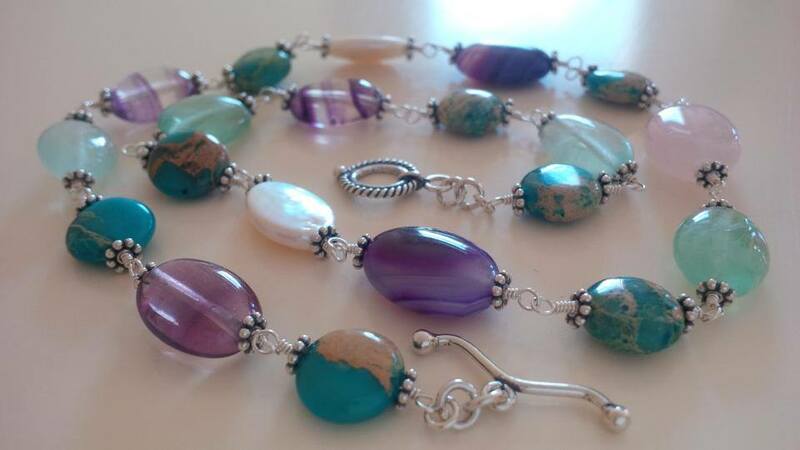 Yet, as soon as we moved here to Vicenza, I don’t know if it was the lack of time or the fact that this blog became my main creative outlet, but I never quite found the impetus to open up my boxes, get out my stash and make a bracelet or a necklace again. Yes, this is the type of jewellery I used to make. But I haven’t done anything like it for a very long time. Still, at the back of my mind there has always been a small inextinguishable thought – that one day my creative enthusiasm would return and I would start making things again. It being spring – a season of renewal when nature herself puts on her creative cloak – I noticed that this thought had been playing more and more on my mind. 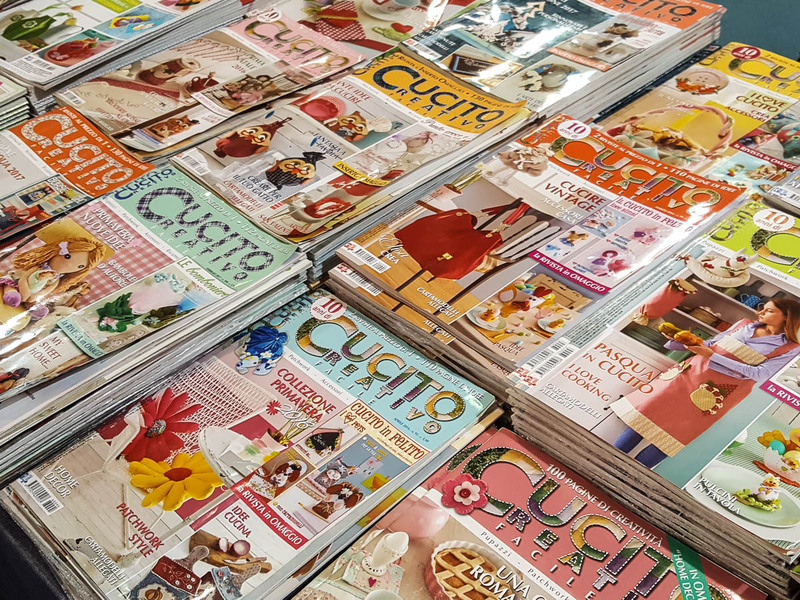 As luck would have it, last week I found out that the spring edition of a large craft and hobby fair was to take place here in Vicenza. 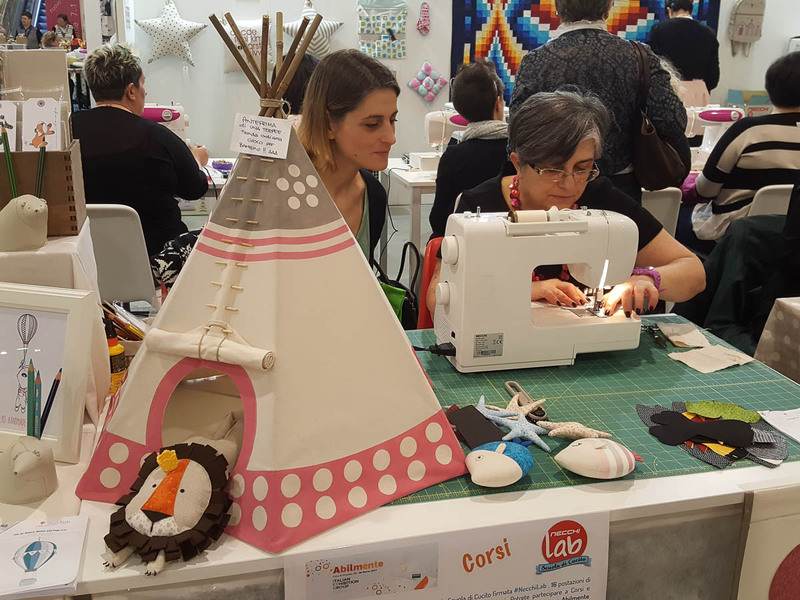 Called Abilmente, La Festa della Creativita it is held twice a year – in March and October – and it attracts crafters eager to see the latest tendencies, products and designs in the world of creative hobbies and crafts. Plus, it features the most renown names in the field of artistic pursuits from all over Italy, showcasing their projects and techniques. In fact, (going off on a tangent here a bit) I remembered visiting the fair’s autumn edition a year and a half ago, when my little daughter and I spent a lovely Sunday afternoon there browsing the vendors’ stalls, admiring some patchwork designs and buying, among other things, a paint set with sponge brushes which, in fact, she still uses at home. So, yes, (getting back to the point) I was looking for some creative inspiration, a little kickstart to get me back into the habit of making things again and then the spring edition of Abilmente happened just at the right time. As they say, when the student is ready, the teacher will appear or, in my case, not one but many inspiring teachers came along just when I needed them. Below I will introduce you to some of them and will show you pictures of their crafts. First things first though, let me give you some details about the fair as such. 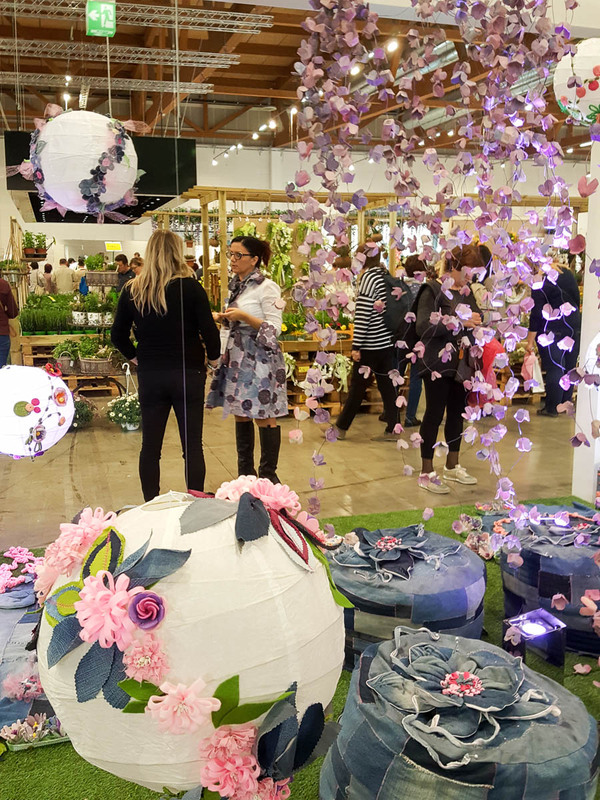 I was able to attend the fair with a press pass, which, I admit, is a nice perk of spending so much time, blood, sweat and tears on this blog. As always, all opinions are my own and, as you know, I like telling it as it is. 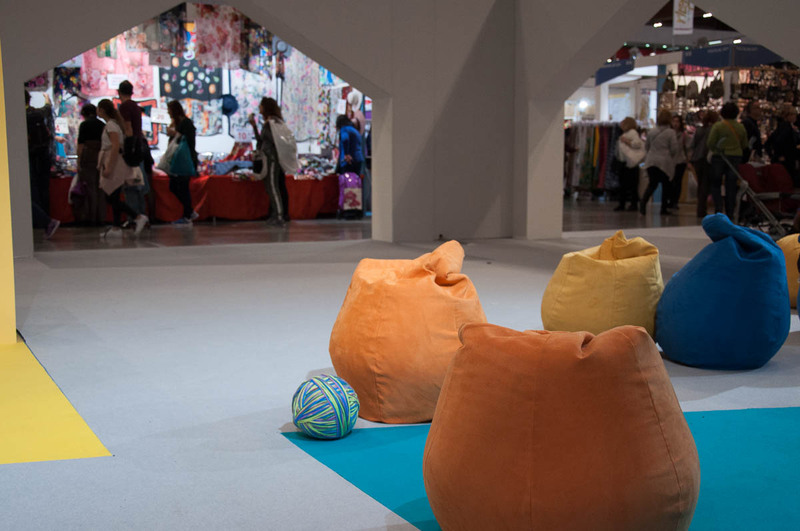 The Abilmente fair took place over four days at the end of March in the cavernous halls of Fiera di Vicenza – an exhibition centre on the city’s outskirts. 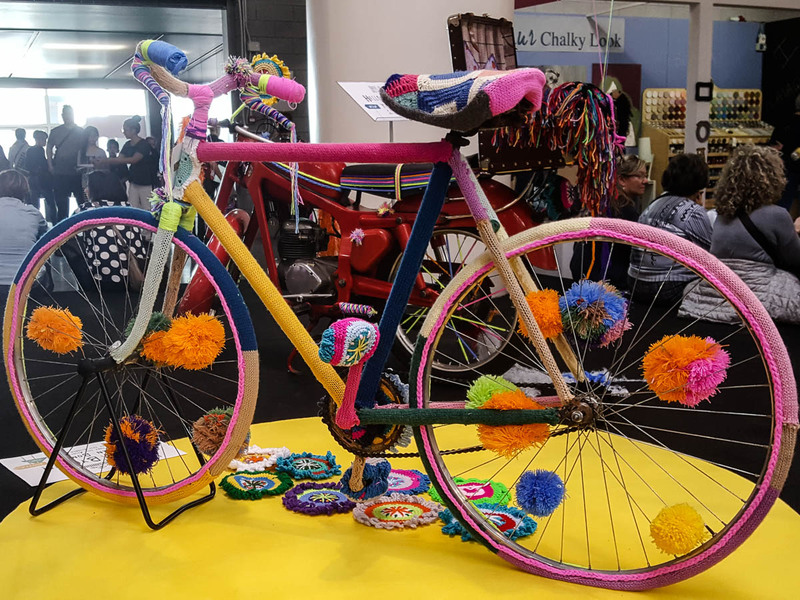 All sorts of crafts and creative pursuits were represented – from crochet and knitting to patchwork and creative sewing, from paper crafts to jewellery making. And then some. 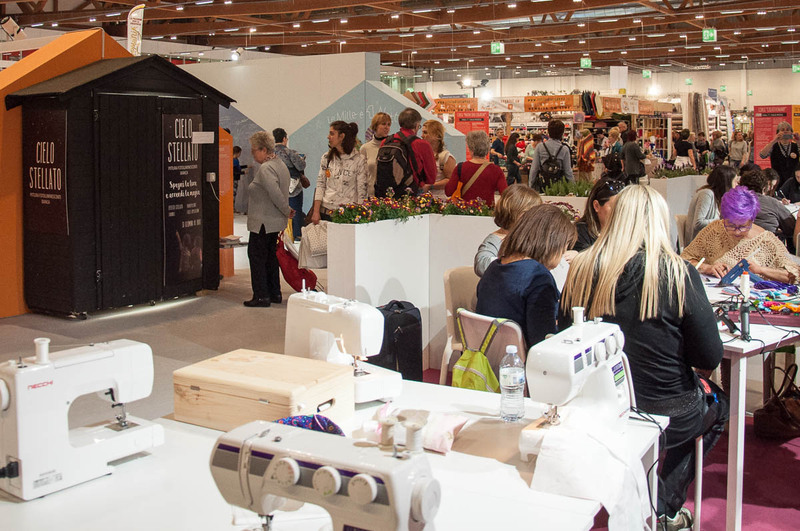 Exhibitors and vendors from all over Italy and abroad took part – the halls were full with stalls of large and small brands selling both traditional and innovative products and lines. Art and craft installations had been set up through the halls and I especially liked the ‘Hello, Spring’ structure by the CreativeMamy collective. Here is a close-up and you can see all of it on the third picture from top to bottom. There was a rich programme of events, free demonstrations and paid-for courses. 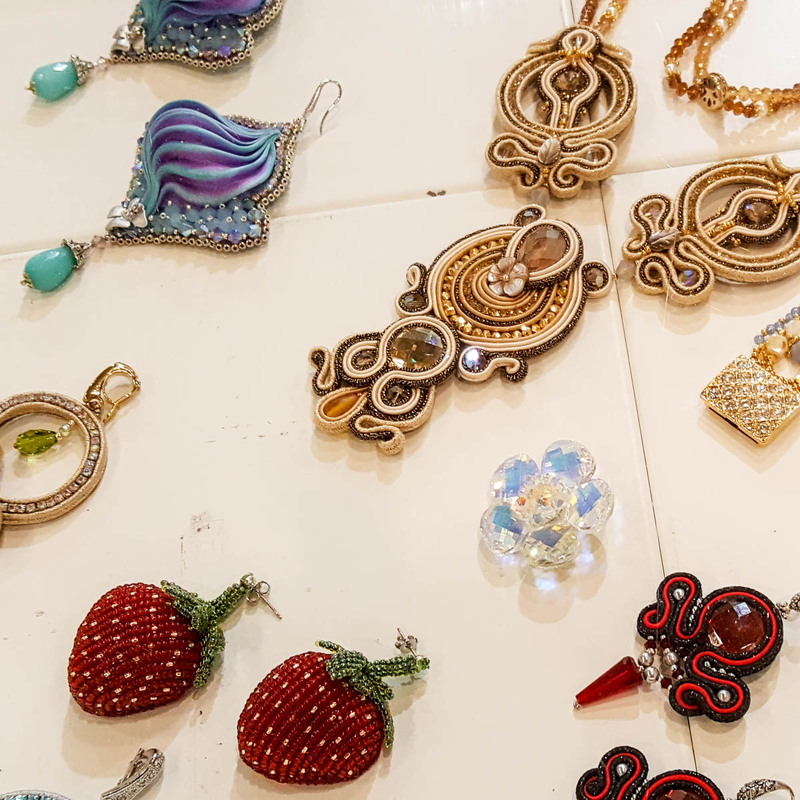 You could try your hand at all sorts of crafts – at seemingly any skill level – from making paper dolls and cute tulle birds to beading a very intricate one-off jewel. 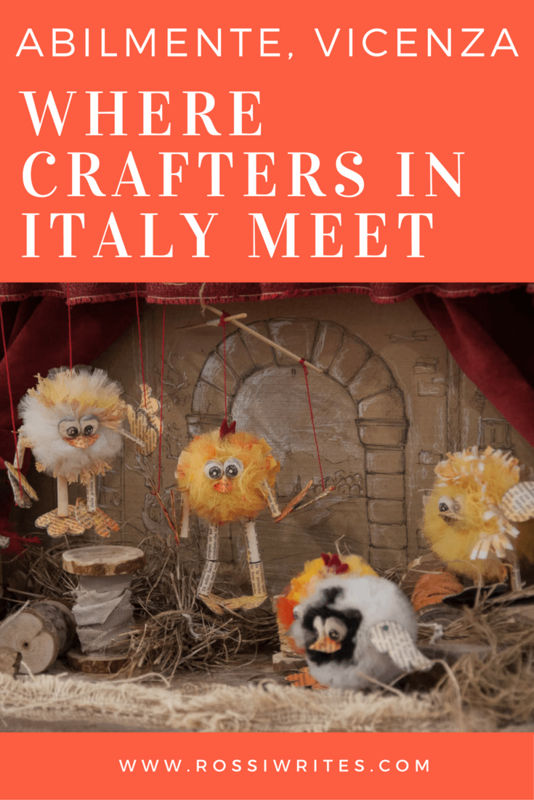 In addition, there were also courses about taxation and business skills for craftspeople, as, it would appear, crafting is a very active cottage industry in Italy. 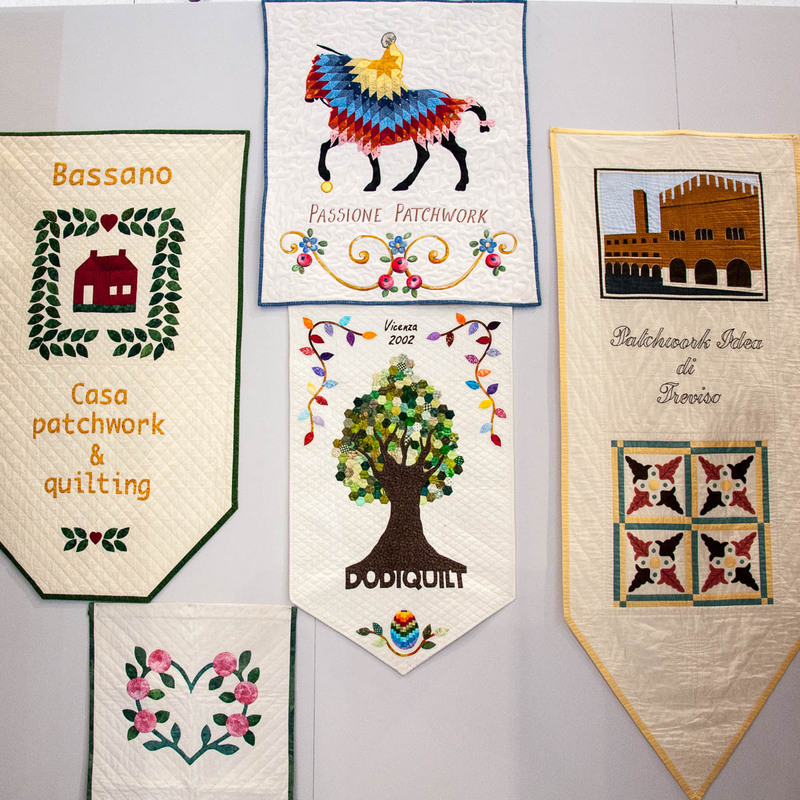 The most interesting thing for me was the presence of several craftspeople – well-known and respected in the country – who propel forward the contemporary craft and hobby movement in Italy. Below I will introduce you to the ones I had a chance to see/speak to and whose work really made an impression on me. 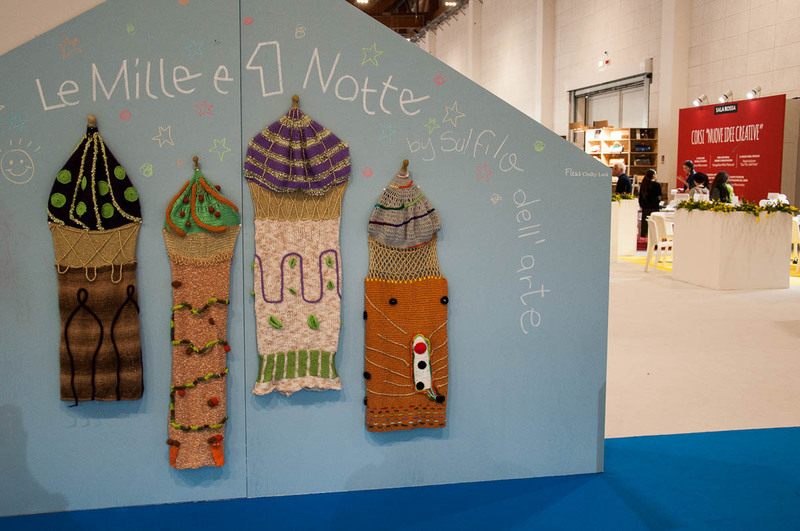 Well, I am always impressed by ladies who are doin’ it for themselves and at Abilmente I came across several entrepreneurial and creative stars in the world of Italian crafts. 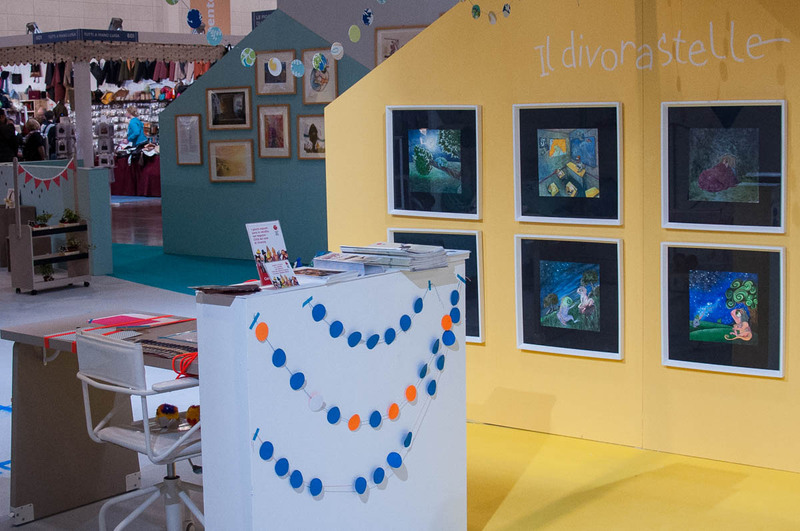 First, let me introduce you to Maria Veneziano and her brainchild – the CreativeMamy community which was started less than three and a half years ago and already has close to one million and a half followers on Facebook alone. 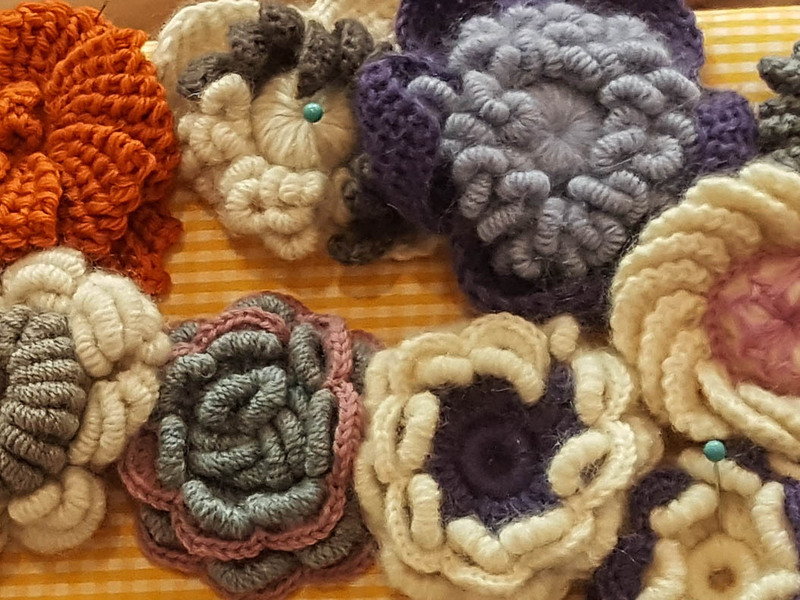 The community creates and shares craft tutorials and projects and its users are Italian ladies in love with the craft world who create handmade objects both for pleasure and to sell. but she also gave my little daughter a handmade fabric butterfly and told us to attach it to a hairgrip to turn it into an accessory. We were instant fans! I also met two other ladies from the CreativeMamy community. 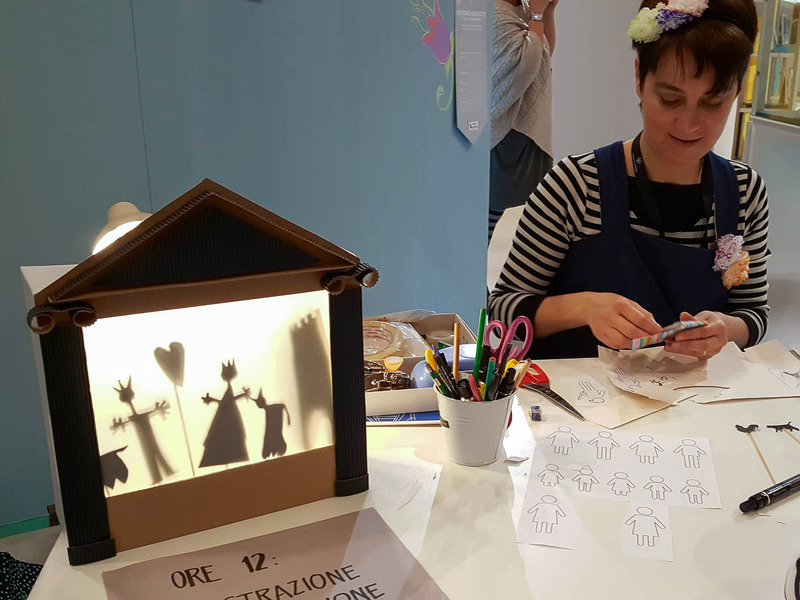 Elisa Meneghin caught our imagination with her handmade shadow theatre. She showed us how to make small paper dollies to stage little plays with and then demonstrated how to build up the theatre itself. I loved the fact that she used very ordinary materials to create something so spectacular that every child would want to make and have one. For example, the shell of the theatre was actually an old shoebox, but I hadn’t actually noticed that until she told me. 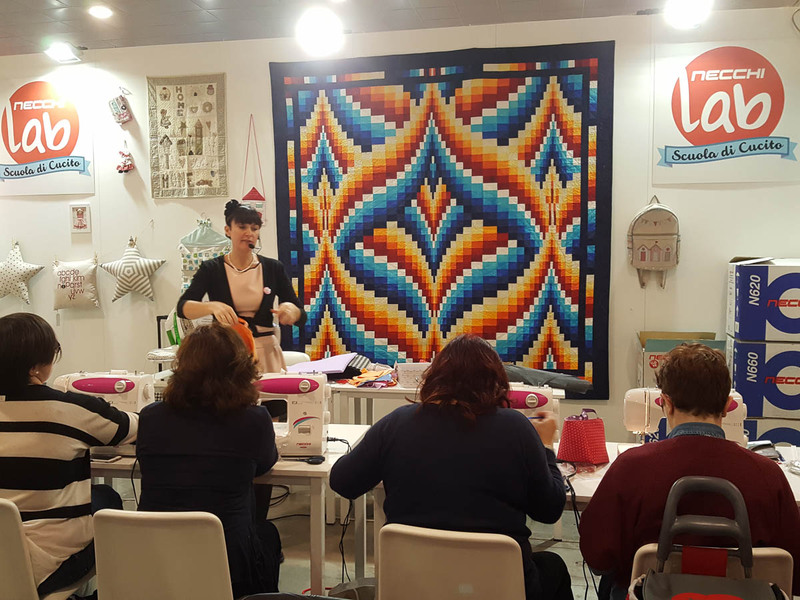 Milena Fanton led a very popular hands-on demonstration showing a never-ending stream of eager children and parents how to make a cute bird out of tulle. 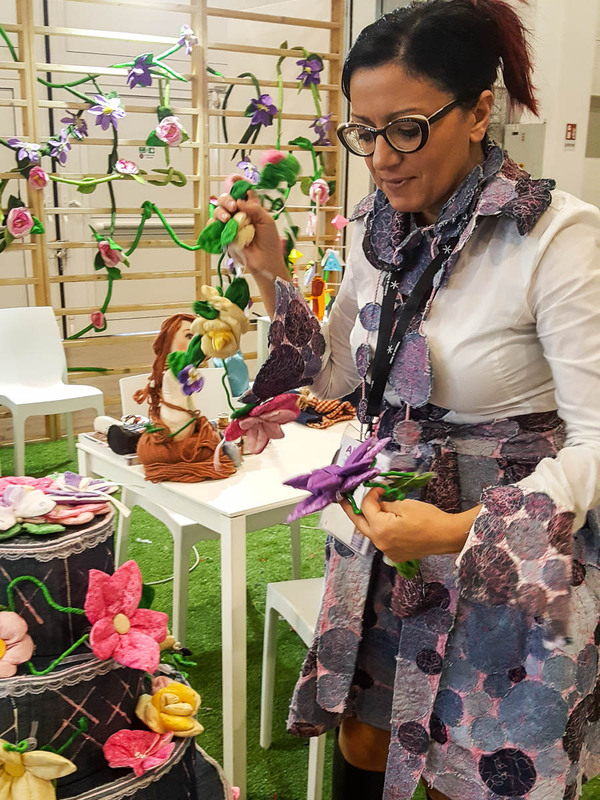 I am hoping to be able to talk to Milena some more soon, as she is based in Vicenza and makes some incredible paper statues and decorative wreaths. What I loved about the work of all these ladies is how it seemed to re-purpose many everyday materials to create something of beauty. Like these flowers which (if you look closely, you’ll see) were made of pink plastic bags. 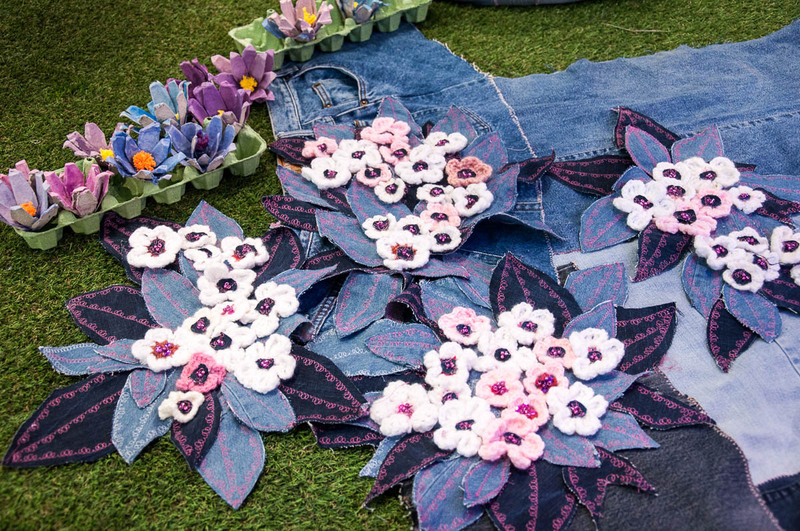 Egg cartons, fabric offcuts, tiny pieces of paper, wooden spoons. You name it, it was used to create some stunning designs. 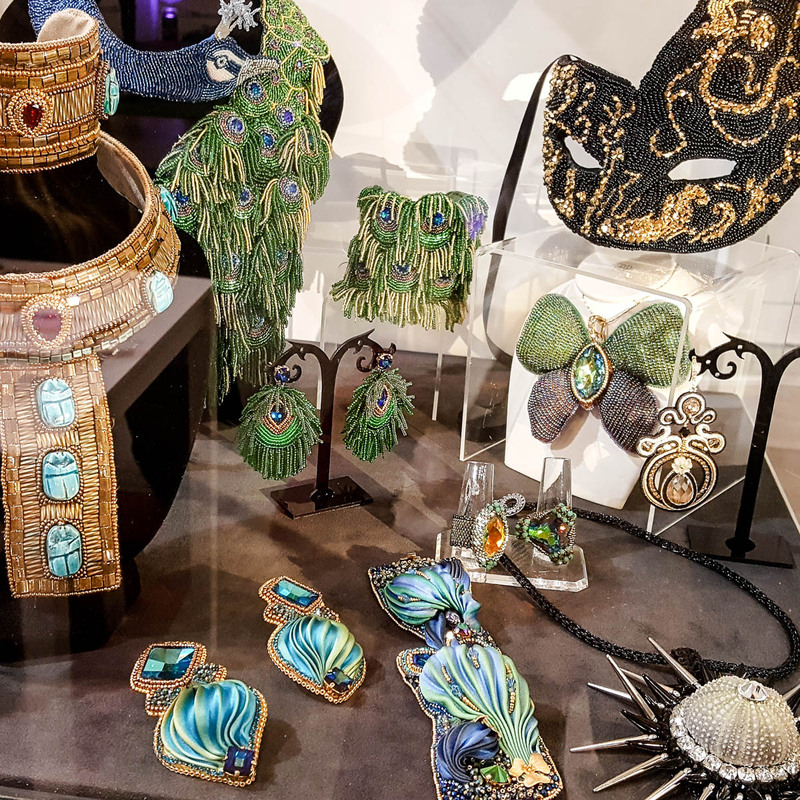 Monica Vinci – a jewellerer working with beads to create some incredibly intricate and sparkling designs. 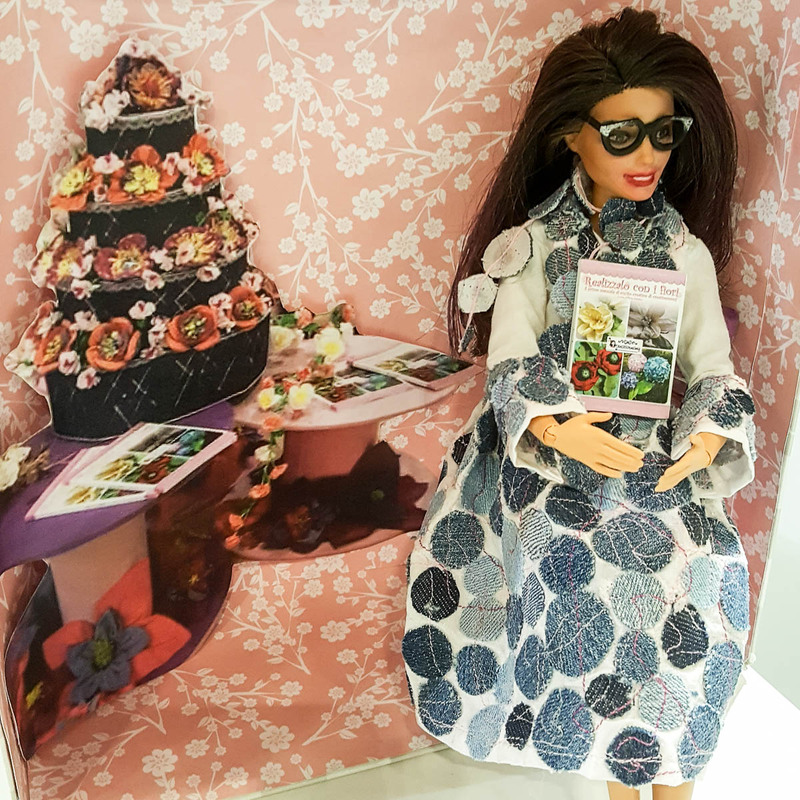 Nerina Fubelli – a knitting and crochet artist and craft magazine and book publisher. 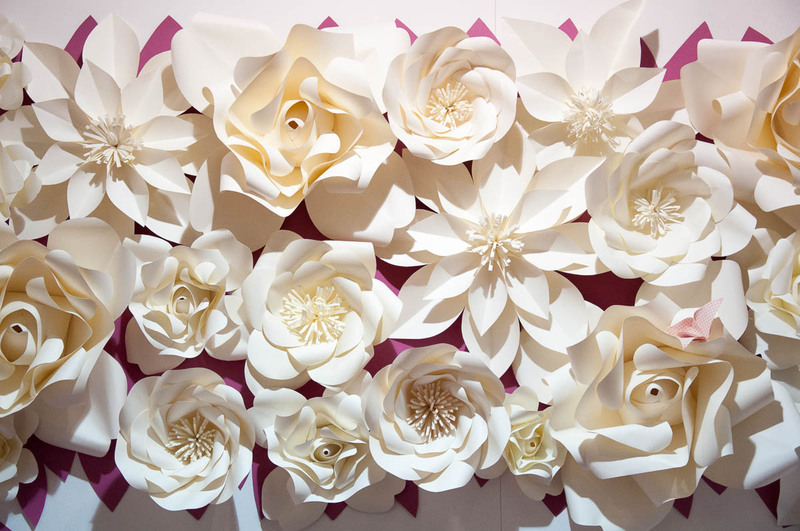 Monica dal Molin – the creator of these stunning paper flowers. 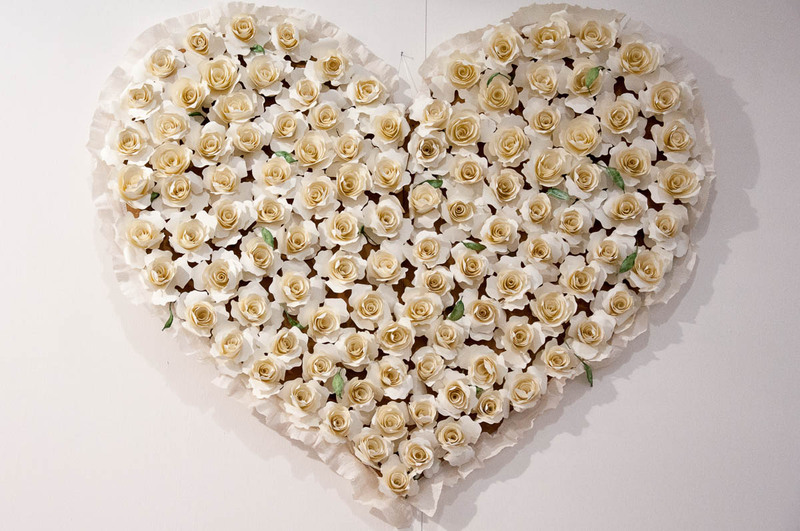 Honestly, I wish I had known of her before I got married, because I would have loved to have a decoration like this one at my wedding. I have to say that my wedding was a simple and small affair, but looking back I clearly see that it could have done with a decoration like this. 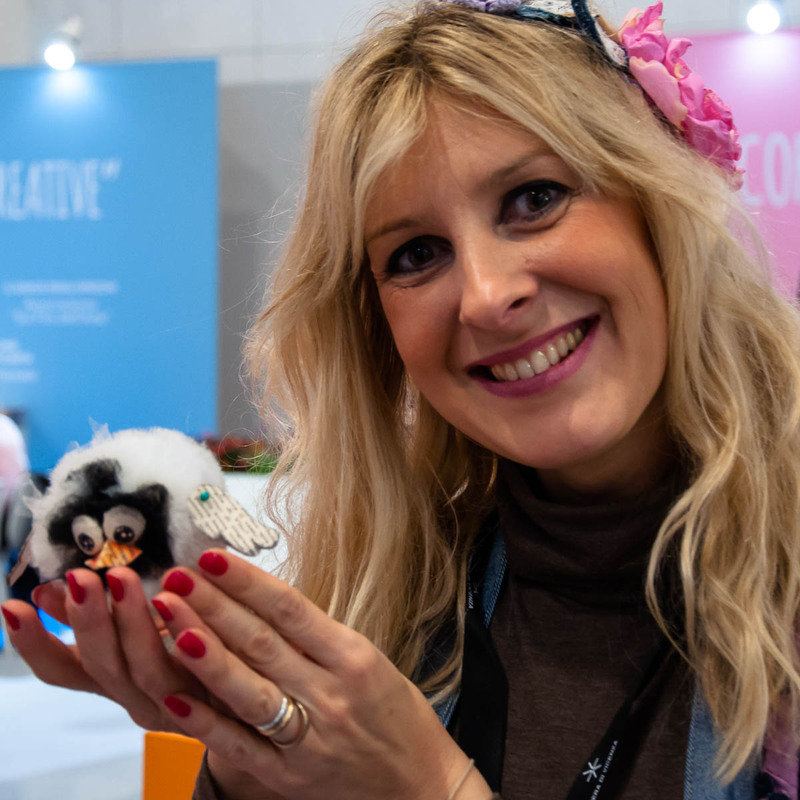 I also loved coming across the stand of a lady called Giovanna Monfeli who, under the trade name Jo Handmade Design, makes some of the cutest toys and cushions. 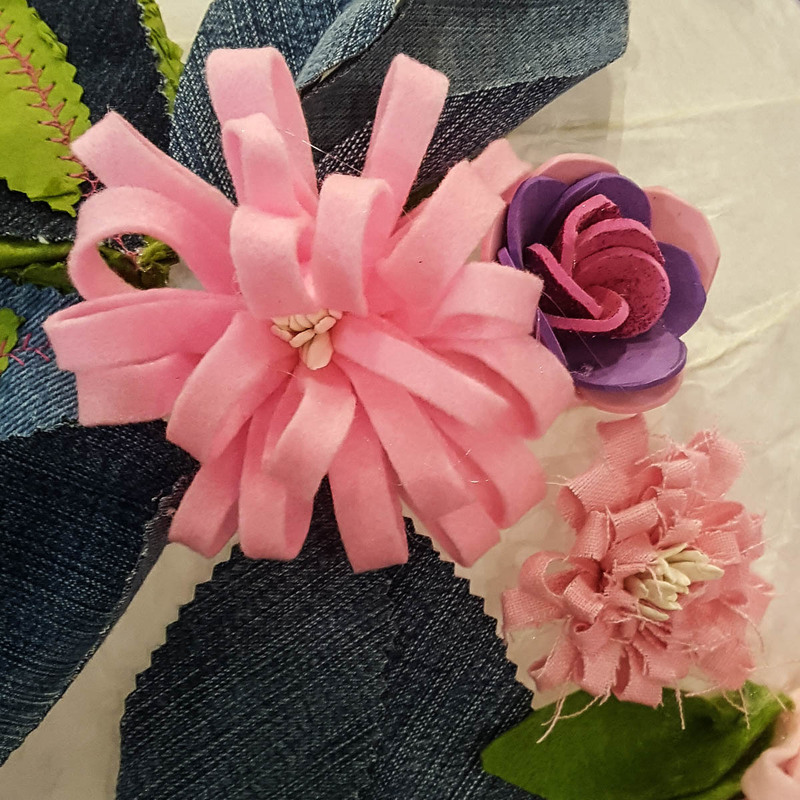 I have linked the names of the respective crafters to their websites and Facebook pages, so make sure you click on them and have a look at their work. It is more than worth it spending some charmed minutes or even hours just admiring all that handcrafted beauty. 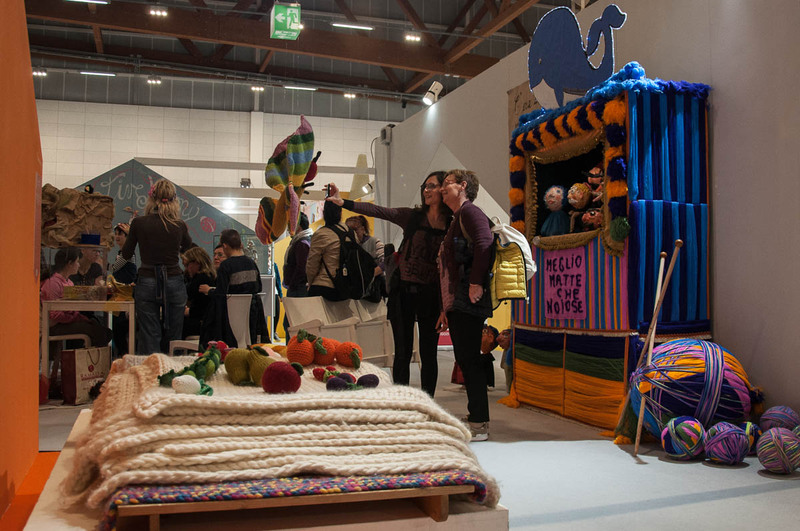 Finally, I would like to share with you some tips and tricks about visiting the fair. As I mentioned above, it is held twice a year, so even though its spring edition is now behind us, in October you can visit and see it all for yourself. The fair is big and has hundreds of stalls and events. We visited on Saturday morning and, even though we spent four hours moving from stall to stall and from a creative space to a creative space, we didn’t see it all. So, make sure that you wear comfortable shoes and clothes and plan accordingly. It can also get very busy. My impression was that the hall, where most of the commercial brand stalls were, was at one point heaving with people. There was no shoving and pushing, nor it felt oppressive, just a bit compact at times. Personally, I gravitated towards the spaces where the demonstrations and the courses were taking place. Next to them there were also some lovely open spaces for the kids to listen to live storytelling, listen to music and to draw with chalks on a large board. 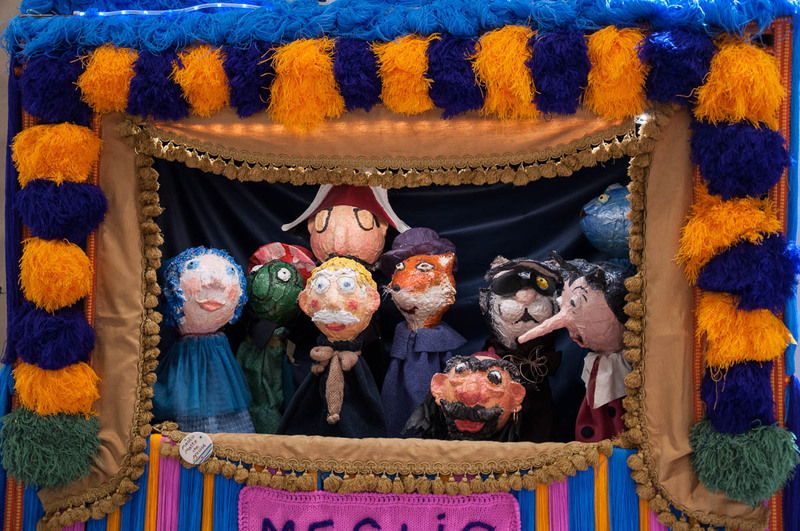 The fair is a great place to spend time at with your children, as they can see and try their hand at many different types of crafts. My only advice would be to explain to them in advance that some of the handmade things on display can’t really be touched even though they look so beautiful and tempting. There were bars serving fresh salads and panini. There were queues at lunchtime and as the tables got very busy, people simply sat on the floor and on some large beanbags to eat their lunch. Lots of visitors seemed to have brought lunch from home – this being Italy, people are serious about having good (ideally homemade and cooked from scratch) food. 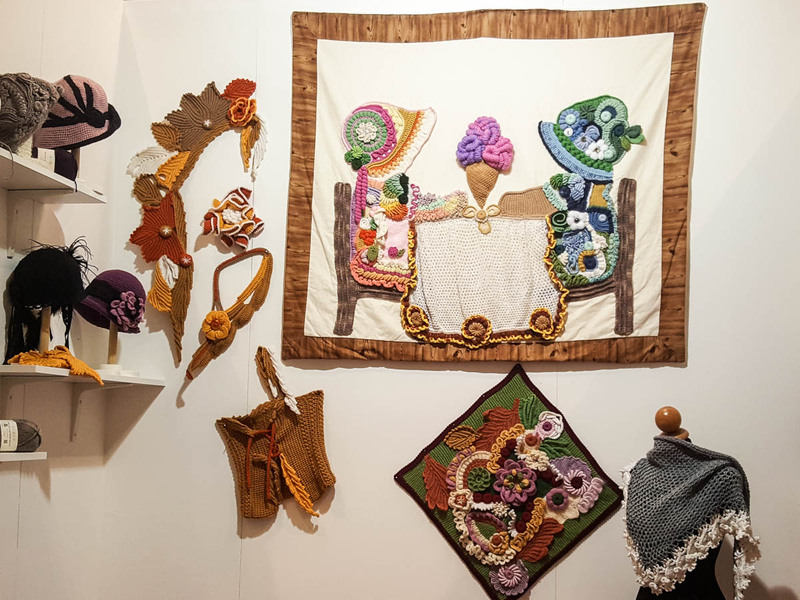 The craft courses can be booked in advance on the fair’s website, but they could be booked in situ, too. 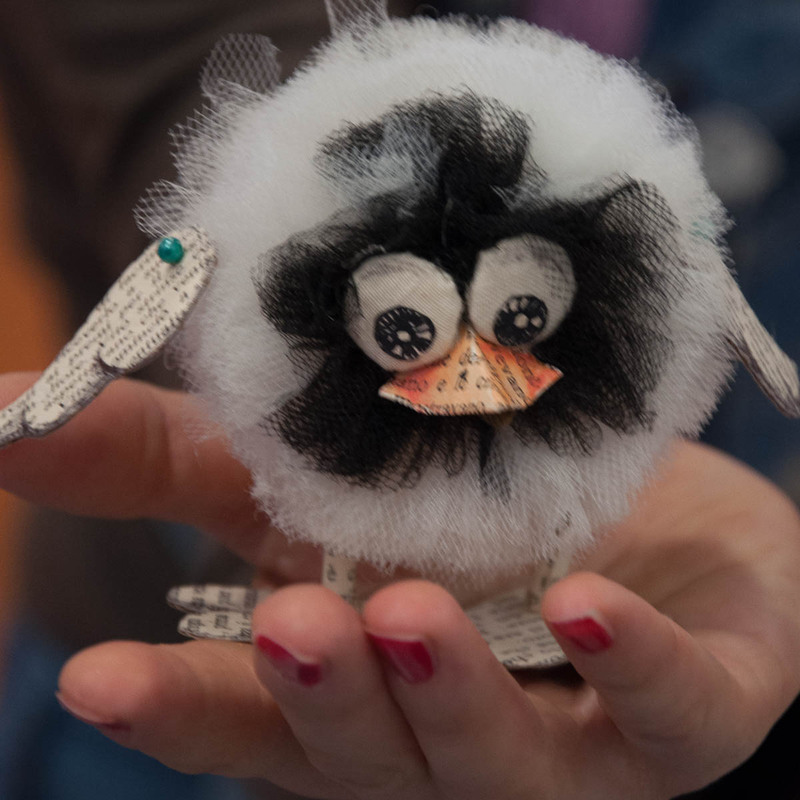 Their prices started from around 10 euros for learning to make small paper books to about 75 euros for learning how to make intricate beaded jewellery designs. I was very interested in a course teaching how to make body creams with bee honey, but as I was with my little daughter, I decided instead to see the demonstrations as they gave us a chance to quietly leave as soon as her attention was attracted by something else. 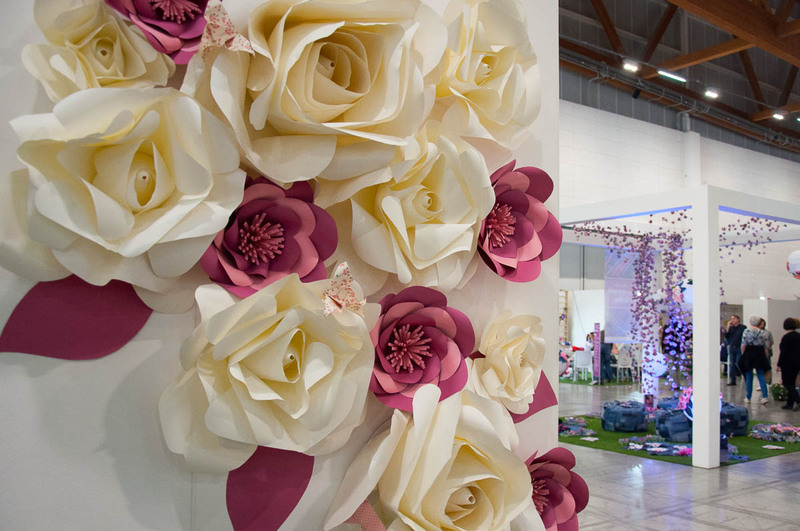 I had a great time at the spring edition of Abilmente and the fair is now firmly in my calendar of events here in Vicenza. 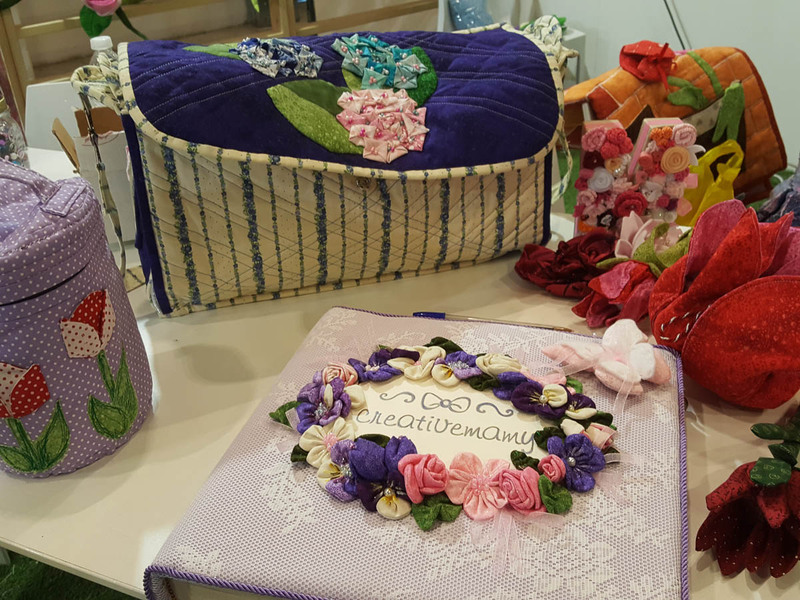 I was really amazed by the number and variety of crafts and hobbies practiced by the Italian woman of any age. I also counted at least half a dozen stalls of publishers of craft magazines. The number of titles and editions on display was staggering. The type of crafting favoured here seemed a bit different to the type of crafting I have seen practiced in England, for example. In England a lot of attention is given to brand products, whereas in Italy the focus seemed to be on imagination and technique. Two days after the fair I am still in a creative mood. Who knows, perhaps I will finally get my stash boxes open and get to play with my beads and tools again. Are you into crafts? Do you like making things with your hands? 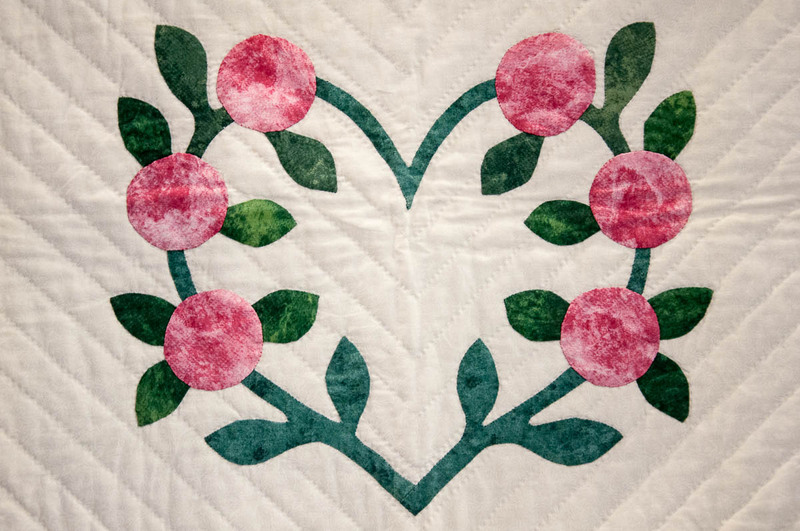 Do you think handmade things have place in our modern lives? Let me know your thoughts!